As you play along the fairways of the Napanee Golf & Country Club today, it isn’t very hard to imagine golfers of the 19th century doing the same. As modernized as the club has become 110 years after it’s founding, you can see why the early adopters of the sport would have chosen such a place to enjoy the game. Within close proximity of the heart of this small town, the land moves to and fro naturally, much like the visible roll you see on the fairways in Scotland, where the game began. At first glance, many people would group Napanee GCC with the full slate of nine-hole public country golf courses that dot the Canadian landscape, but when you scratch a little further a vibrant web of history and complexity is revealed. And after you play the course itself, you just might be shocked at what you find laid out before you. A rich complexity is pretty simple to achieve when you are a club that has been open in parts of three centuries – having welcomed the first golfers to its grounds in 1897. It is not much of a stretch to see why the nickname for the course – “The Granddaddy” was adopted. Today, the club serves almost 300 members from within the community located mid-way between Belleville and Kingston. They are an avid membership made up of golfers of all ages. In fact, until he passed away in 2005 at 101 years of age, Bruce Medd had been an active member of the club since 1932. A very social group, the club members are well represented in local competitions and they have been a participant in the Quinte Cup since the tournament’s initiation in 1921. They have captured it several times. Recently, the club also instigated a home and home competition with golfers in Nappanee, Indiana. The exemplary condition of the layout at Napanee is highly apparent, as you will drive by several fairways on your way to the club’s entrance. Located on the south side of the municipality, the Clubhouse, 1st hole and final green are all set upon a hilltop that gives you a panoramic view of the town of fifteen thousand that was settled by Loyalists in the late 18th century. The unpretentious clubhouse seems to fit the character of the course. The historic nature of the building is a point of pride among the membership. Built in 1926 it has received numerous upgrades through the years. The dining facility was enhanced just a few years ago courtesy of a Trillium Grant and while they amenities are not lavish, they are more than suitable to meet the needs of guests and members alike. Tournaments of up to 140 people can be accommodated. In fact, any major change of the Napanee clubhouse would be shame as the natural wood interior and significant trophies sitting high on shelves convey the club’s extensive pedigree. Innumerable people have passed though this room – everyday members, past and present public figures, future golf professionals (Rob McDannold of Hamilton G&CC and John Boyle of Amherstview GC – both long-time, award-winning CPGA pros, for example) and even the greats of the sport including Sam Snead. Snead, who was known to come to the area to fish and visits friends, just happens to still hold the course record from the original tees with a score of 63, a mark set in 1953. “We point that out a fair bit and challenge people to beat it,” relates Milt Rose. To better 63 would be a tough feat although one of the club’s Wall of Fame members, Glen Wagar, has managed 64 on several occasions and 65 has been posted from the back tees as well. That is not surprising given the many years the course has had to develop. There is no designer of record for Napanee, much like the historic courses of the United Kingdom, it’s nine holes (but ten greens and with eighteen separate tee locations) were crafted gradually – with renovations taken upon by the membership when it has been deemed necessary. Unlike the Auld Sod, however, the Napanee “links” are also replete with grand elevation changes on several holes and a broad number of mature trees, all creating a noteworthy playground for modern golfer. After leaving the friendly confines of the fully stocked pro-shop you will find that the opening hole is just as gracious. It is easily the most level challenge on the course, lulling you into a sense of ease. That until you reach the green and note the heavily sloped green and deep back bunker – a prelude of what is yet to come. Hopefully you are able to take advantage of the opener, as hole #2/ #11 is a tad more “hostile.” From an elevated tee the green on this par three lays some fifty feet below you and up to 200 yards in the distance. “It is just a great hole,” says Rose who can boast of making one of the few aces to ever be recorded on it. Getting the putting surface is challenge enough (make sure to take the scenic path through the woods for full effect) but the once you arrive your real work is laid out before you. Multiple tiers will test the best of those anywhere near proficient with the flat stick. That theme of tough putting carries through the entire course where you will need well-placed shots to leave the easiest of putts. Each green presents an individual green-reading challenge with local knowledge being a clear advantage. As you wander through the spread of holes laid out over more than 70 acres, a common theme does occur – no two holes are the same. Even playing the same greens from alternate tees on the back nine (except for holes #5 and #14 which just share a common fairway) you will find variations that will intrigue you. The variety is endearing and likely part of the reason why people return again and again to test themselves. 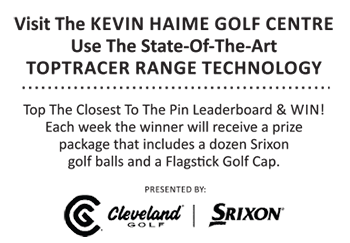 Coupled with terrain that has more in common with the rolling waves of the North Atlantic than a common field of turf, you are presented with shot variances that challenge every full strike. With gullies, ponds, and gracefully aged, dense tree lines all making an appearance you interest is stimulated at all times. This is not a field like layout with holes wandering simply back and forth in straight lines. As you approach the final hole on the layout, many players, if they have played well, will relax a bit but they need to come to full attention to play the closer. “It can be a real tough one to play,” says Rose who recounts many matches won and lost on that very hole. At 410 yards from the #18 deck, you face a par four with a fairway steeply pitched towards you and requiring a precise tee shot to reach the fairway and avoid trouble. Undoubtedly the approach will be played from an uneven lie to a green almost hidden from view save for the flagstick. It normally leaves a suitable final impression on those who may have considered the course “short” upon their first glance at the scorecard. With so much to draw upon, the Napanee Golf & Country Club can be proud of their past. Even so the club remains a thriving one set to continue their legacy. Tournaments and league activity is quite brisk and they are constantly making upgrades to the maintenance equipment, amenities and programs to remain competitive. A putting green, a new fleet of carts, and a member’s range enhance the overall picture. The junior program is very active with up to a hundred kids taking part each summer and the club has still not ruled out a possible expansion to 18 holes. With that said, 110 years of existence proves that Napanee Golf & Country Club must be doing something right. Truthfully, their real secret of success cannot be conveyed by mere words alone – to find out you’ll just have to make your way there yourself. Even if you choose to underestimate it at first – delve a little deeper. I think you will like what you find.